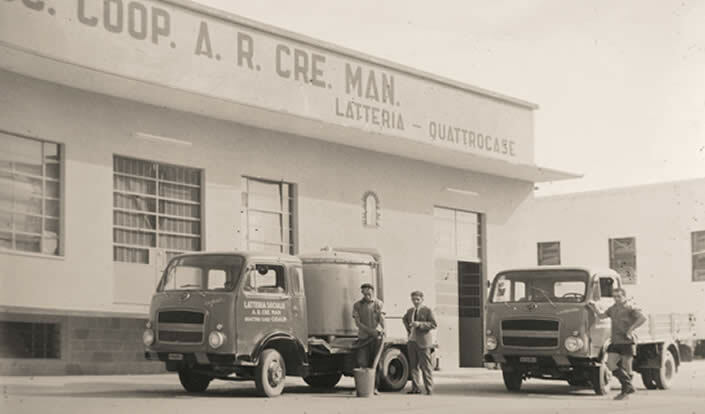 We are at the AR CRE MAN dairy, in Quattrocase di Casalmaggiore, set in a fertile plain between the Po and the Oglio rivers along the boundary between the regions of Lombardy and Emilia Romagna. We are in the province of Cremona, but just a stone’s throw from the province of Mantua. 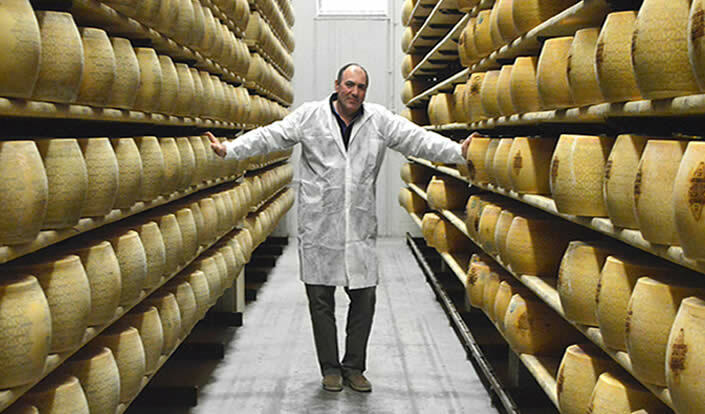 Marino Gardini, who has been the president of the dairy for the past 25 years, begins to tell us the history of the dairy by leafing through a photo album. 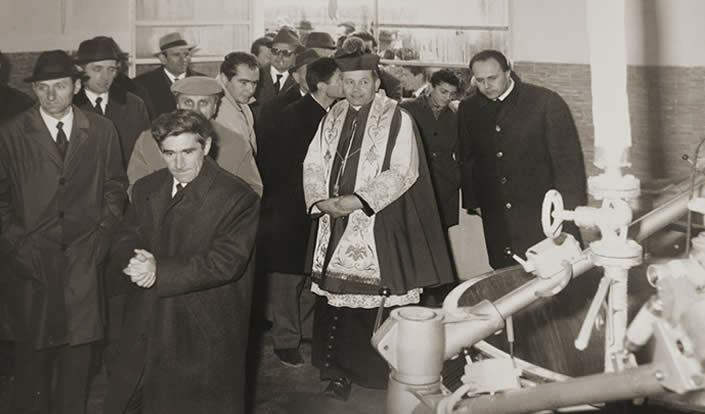 Here we can see some photos of its opening day in the mid-60s, when a great celebration was held with the local authorities attending, along with the parish priest who performed the blessing ceremony. There is still a strong link with religious faith, illustrated by the little shrine to the Virgin Mary set into the dairy’s façade. There are also photos showing the old milk trucks with the tank into which the iron churns were emptied, strictly by hand. In the 60s the milk suppliers in the cooperative numbered as many as 43 and were small-scale producers; today there are only 8 milk suppliers while milk quantities have more than doubled. Time has radically changed the structure of the dairy farms; technology has led to cleaner facilities and a stronger focus on the welfare of the animals. But there is nevertheless a constant theme running through past and present, consisting of a number of steps that remain unchanged and enable the product to keep up with the times while at the same time preserving its distinctive original features. 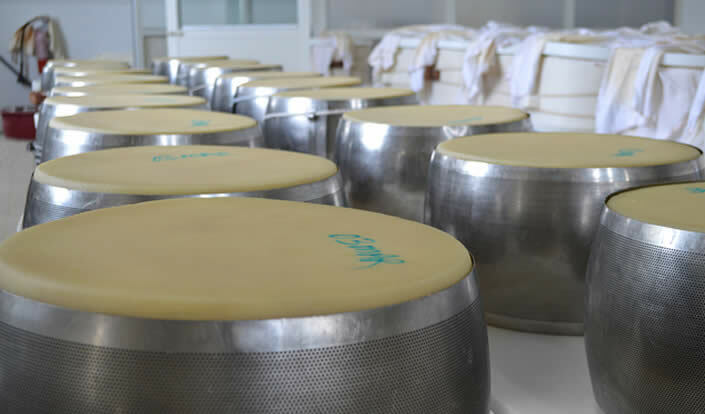 This dairy produces 40 wheels of Grana Padano every day, including Saturdays, Sundays and public holidays when its employees work in shifts with passion and self-sacrifice. Marino tells us that one of the cooperative’s dairy farmers has recently ceased his farming activities so as to enjoy his retirement, but he is finding it impossible. After devoting 45 years of his life to his cows, he still goes back to the cattle shed every morning, and although it lies empty, it is such a big a part of his life that he can’t let go of it. previous: Agricola Zani Società Agricola s.s.